Given their history together, it was no surprise the two teams went past regulation yet again. 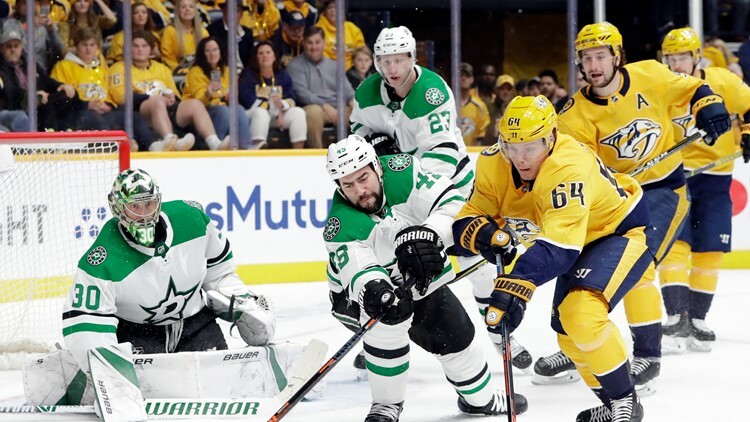 NASHVILLE, Tenn. — (AP) Craig Smith scored five minutes into overtime to give the Nashville Predators a 2-1 victory over the Dallas Stars on Saturday, tying the first-round Western Conference series at 1-1. Dallas took the lead at 1:59 of the second when Tyler Seguin got the puck off a turnover, passed to Benn at the side of the net for the captain's first goal this postseason. Stars center Mattias Janmark went straight to the locker room after a collision with Predators' defenseman Dan Hamhuis into the boards. Janmark was down for a couple minutes before being helped off the ice at 3:10, putting no weight on his left leg. Nashville tied it at 3:56, with Grimaldi scoring over Bishop's glove from right in front off a pass from Austin Watson. It was the first postseason goal in Grimaldi's third career playoff game and first with Nashville, and he was in the lineup only because forward Brian Boyle is day to day with an illness.